The team wishes you a warm welcome to the heart of the Normandy. Set in the modern Docks district along the River Seine, the hotel is a 5-min walk from restaurants, a cinema, sports center, museums and many shops. A hotel designed with you in mind! Experience the Novotel Suites Rouen Normandie hotel on the banks of the river Seine. This comfortable, modern hotel is perfect for family vacations, romantic getaways, or business trips. Enjoy delicious meals at the Boutique Gourmande or in the privacy of your 323-sq. ft. (30-m²) Suite. Relax in the fitness room or trace the steps of Joan of Arc and the Impressionists. Discover Rouen's city center, just a 15-minute walk away, and get away from it all at Novotel Suites. Thanks to the new Press Reader app, our hotel allows you to download more than 2700 publications free of charge. This completely free application also offers a selection of newspapers and magazines by country (134) in more than 50 languages! Enjoy many sporting events at the Kindarena, just a few minutes' walk from the hotel. 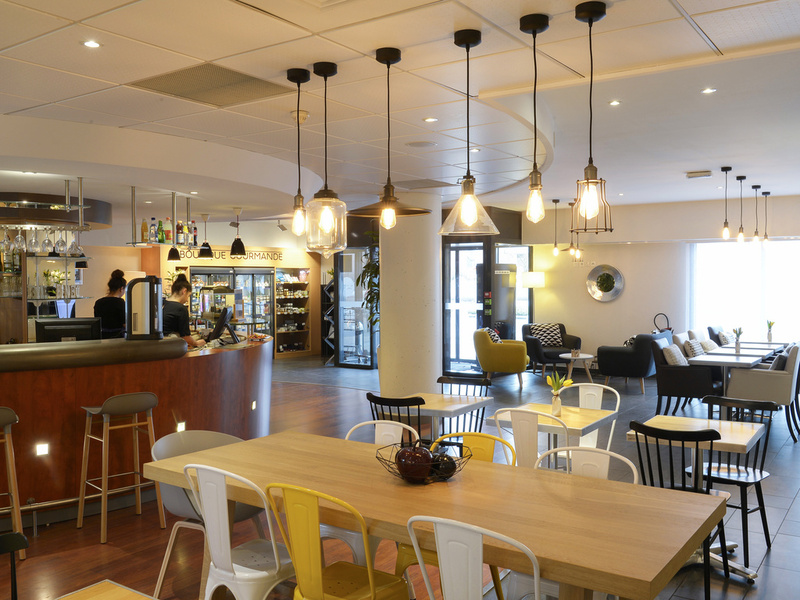 The Novotel Suites Rouen Normandie hotel is easily accessible from the A29, A150 and A13 highways. Private underground paying car park (6 ft. 3 [1.9 m] max.). Quick access to A13, A150 and A29 highways. Our stay was for 3 nights. The room was spacious and comfortable with good facilities. A great location for visiting Rouen with a nice walk to the centre or a stroll along the quays. Well located hotel with basic amenities. Room provided was spacious and beds were comfortable. Toilet and bath being separate was helpful. Breakfast was underwhelming and after the first day, we decided not to have in the hotel. Some activities were there for our older child. Staff were helpful despite the language barrier. Exhaust fan in the toilet was not functioning and despite complaints and assurances from reception, was not fixed till we left. I have stayed several times in this hotel before. It’s the one I prefer in Rouen. However I had some issues during my last stay. very pleasent; everything worked without issues. Great customer service. Staff was terrific and very helpful. Completely inflexible when trying to change my reservation. Cancelled on a night that was overbooked and received no refund. While I am sure that they sold my room. Charged me for breakfast (included in the rate) that I never ate because I didn't stay at this hotel. We enjoyed a three night stay in order to do our Christmas shopping and despite the manifestations of the &quot;giblets jaunts&quot; at Barentin centre commercial we had a very enjoyable experience. On arrival, we were greeted in a very friendly and efficient way by staff. Our suite was clean, warm and well equipped. We did not experience the breakfast as we thought it a little too expensive, but, overall, a comfortable hotel which we would recommend. This was our 7th stay at the hotel and a vast improvement on our last. We were given, as requested, a room on the 3rd floor overlooking the Seine. The 3rd floor has refurbished rooms; much nicer than the 2nd floor. Only downside was the cleanliness of the bathroom and the coffee/tea supplies that had not been refilled. Comfortable and very close to everything. The staff were friendly and accommodating. We enjoyed the position of the hotel. A brief walk in to the town centre and the restaurants situated along the river. Very accessible to everything. The room was quite spacious and functionally equipped, having a separate WC and bathroom is nice and a choice of shower or bathtub is also great. But why install something resembling a kitchen if there are no plates and no cutlery? Also, the room was only superficially clean, there were heaps of dust in every area that was a bit hard to get to, e.g., corners and around the furniture. Good rooms, however breakfast can be improved, as most of fresh fruits were not in good quality condition to consume. Nice hotel, good location, spacey room. Good and polite service. Liked the room a lot. Nice and rather large room, view over river Seine. Good and attentive service from the staff. Friendly staff, comfortable beds, clean and modern rooms, good breakfast. The room was well equipped and comfortable. Pleasant outlook with a view of the river. Only negative comment was our room service breakfast card was not collected and we had to take it to reception. When the breakfast arrived there was no milk with the cereal and the bread (French stick) was hard. Reception staff friendly and understood English. Lovely room, great breakfast. My husband is very fussy about his car so we were pleased it had an underground private car park. When we arrived we weren’t allowed to park in it unless we left by 9am next morning! So we had to park on the side of a road. The car was ok but he worried all night. We loved this hotel. Very nice design, specious room, coffee machine (-: and other treats. Reception girls were very nice and friendly. Need to improve: 1. few dishes for self catering (plates, Cutlery) 2. Refrigerator is very small, it's shelves are missing, and you can't have Ice.